A low impact workout, including a mix of aerobic exercises, water walking, light jogging, some hand bar use and stretching exercises. This class is designed to increase range of motion and balance with the added benefit of caloric burn (no swimming ability required). A workout designed to increase muscle strength, improve range of motion and balance while melting inches away. This class uses aqua barbells aqua noodles and paddleboards during core, upper and lower body workouts (No swimming ability required). A deep-water aerobic workout designed to burn calories while strengthening muscles using water as resistance. Aqua noodles are used for flotation while jogging and performing aerobic exercise routines (Flotation belts are available upon request). Must be able to swim! Class designed for children ages, 9 months to 2 years old. Class is a water adjustment class. Children must be accompanied by an adult 18 years of age or older. Swimmers must wear tight fitting rubber pants or swim diapers. The Preschool Swim Lesson Program is designed for children ages 3 to 5. Four levels take children through all aspects of the water environment. The aspects include Personal Safety, Personal Growth, Stroke Development, Water Sports and Games, and Rescue. The YMCA’s character development values- Caring, Honesty, Respect, Responsibility- are also incorporated into the program. The Youth Swim lessons are designed for youth, ages 6 to 12. 6 levels takes youth through all aspects of of the water environment The aspects include Personal Safety, Personal Growth, Stroke development, Water Sports and Games, and Rescue. The YMCA’s Character development values- Caring, Honesty, Respect, and Responsibility – are also incorporated into the program. Classes are centered under each adult and their own personal goals. Range from beginner to Advanced-Beginner. Participants will go on an open water dive to complete their certification. Participants should be in good health and should be able to swim at least 200 yards. Age: 12 yrs old and up. Contact the Y for the next scheduled class. In association with the Smith River Canoe Club, members practice techniques in the swimming pool. Must have your own kayak. Certification course as a YMCA Lifeguard. Class includes: lifeguarding, CPR, First Aid, and oxygen administration. Cost is $250 Prerequisites: Ages 16 and over. Must be able to swim 500 yards, or 20 lengths, tread water, and swim underwater for 15 feet. Click here for upcoming class info. Instruction centered on the Boy Scouts of America guidelines for achieving a swimming merit badge. Instruction is level specific. Cost is $40.00 per troop. 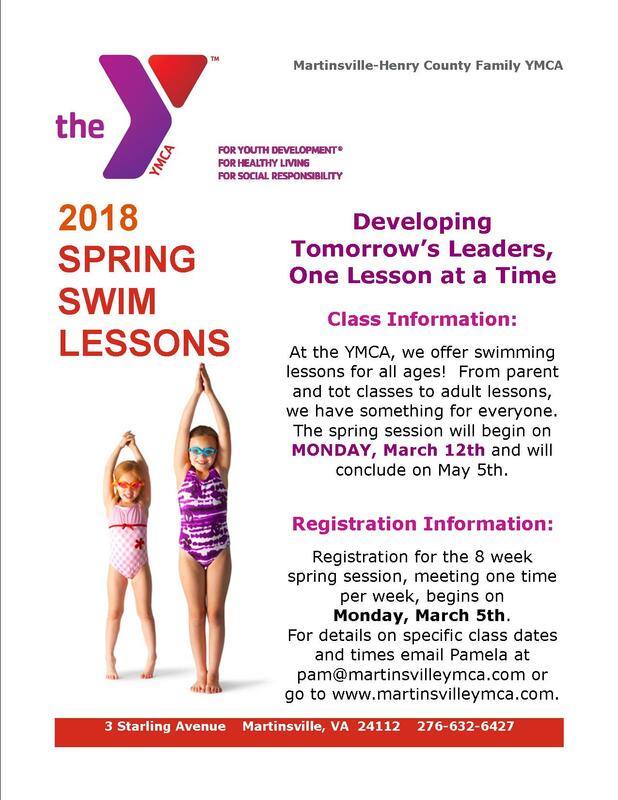 The Martinsville YMCA Marlins Swim Team is a year round competitive swim program for children ages 5-18 living in the Martinsville , Henry County, and surrounding areas. The team swims year round and competes in both YMCA and USA Swimming meets. Swimmers are divided into 4 groups Red, White, Blue and Senior group. The amount of practice time will depend on what group they are assigned. The Martinsville YMCA Marlins are a proud member of the PYSA (Piedmont YMCA Swimming Association) League and the Upper Southeast YMCA Swim Region, which is made up of of all the YMCA swim leagues in Virginia, Tennessee, North Carolina, and South Carolina. the majority of our Y swim meets are held with the other 10 members of the PYSA which include: Roanoke area, Bedford, Eden, Franklin County, Altavista, Danville, Alleghany, South Boston, Farmville, and Pulaski. USA Swimming meets are typically held in Roanoke, Christiansburd or Greensboro.